It’s been 18 months since this project started and it’s a pretty good time to check in on progress so far. The aim is to get to zero energy costs, so if they’re measurably less than they were, then that’s progress. If you remember from the first post, the first step to reducing something is measuring it, so I’ve been measuring our bills in Electricity, Heating and Transport on the same day every month since then – not waiting for bills which are often estimated, but reading the meters on the last day of each month and recording the values so I can compare them over time. The picture is good. 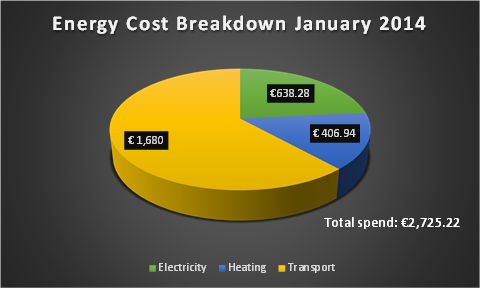 When I started measuring monthly energy costs in January 2014, our yearly total cost was €2,725.22 per year. 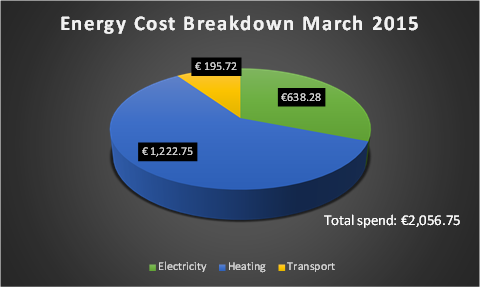 As of March 2016, it was €745.92 per year. We’re now saving €1,979 a year from where we were. Energy Costs Since The Start Of This Project – down from €2,725.22 per year to €745.92 per year. That’s 72% cut! Switching to an electric car took a huge chunk out of our transport costs. 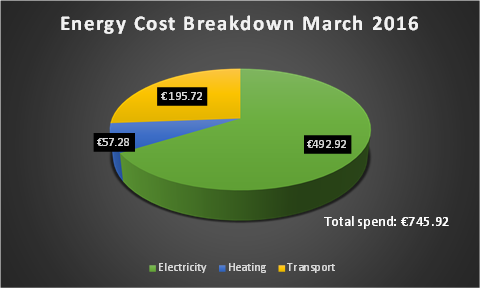 It went from costing €246 per month (petrol, tax) down to €24 (electricity). It has been nice having €222 extra in our pockets each month after that. Adding the wood burning stove has also clearly eaten into our gas costs each month. We pay €0.06 per kWh for gas, and about €0.01 per kWh for wood, so each night that the wood burning stove is on and heating the house, we’re saving 83% of the cost of heating the house that night. The reduction is pretty clear when comparing March 2015 with March 2016. Switching all of our light bulbs to LEDs is saving €87.29 per year, which is why our electricity bill hasn’t increased much when we switch to the electric car, even though it also includes all of our transport costs now too. Heating and Transport energy costs are way down. It’s pretty obvious – our electricity costs are the next target. For this, I believe Solar PV will be the answer to attempt to bring this cost down towards zero. The price of panels have been plummeting, and efficiency in overcast countries like Ireland has increased a lot. All in all, progress has been fantastic. Saving €2,000 ($2300) per year is considerable – given a marginal tax rate of 51% in Ireland, it’s the same as getting a raise of roughly €4,100 per year in work. This money has been stacking up to invest in further energy investments, and once our energy costs are down to zero, it’s going to stack up in a retirement fund pretty quickly. Most of the investments have also increased our quality of life too – the electric car is both more powerful and much nicer to drive than the previous petrol car, the wood burning stove has literally brought the family together in winter evenings, the energy monitor in the kitchen gives us something to talk about and is a great educational tool for my son for both energy and finance. Last but not least, as of this month, our energy savings have so far resulted in 8,170kg of CO2 not being released into the atmosphere. Eight Tonnes! It shows how a little effort can yield pretty decent results. We’re 72% of the way there now. Onwards and upwards!